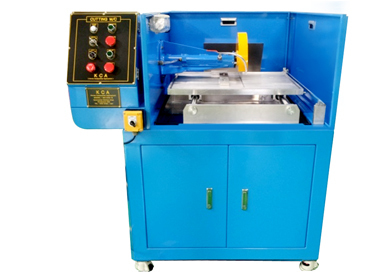 Composite material dedicated Cutting M/C is designed to suitable to accurate cutting for composite material. It is the most widely used for domestic professional company for composite material with approved performance. With accurate process and assembling, cutting with less than 0.2mm of precision and squareness is available. Burr/Delamination on cutting surface cannot be generated by using Diamond coated wheel. With excellent surface roughness on cutting surface, accurate cutting is available. With high-speed rotation, fast cutting is available. With small amount of noise and dust, it is suitable to indoor work. It is convenient for repeated cutting with same measurement. With easy operation, everybody can use with ease. With coolant circulation method, contaminants are not discharged. You do not have to worry about cutting or hand injury from cutting wheel. ※ It is divided into normal type/large type.